I guess I have been growing my own veg now for nearly 20 years, ever since I had an allotment in South Birmingham when the boys were little. Throughout my career, I have also found that there have been lots of opportunities to encourage others to do the same, and particularly to get children to have a go at growing some food. With this in mind I was very happy to help out with a new BT schools project, which actually started last year, and moving forward into this year it’s looking really good. Through their sustainability and volunteering programme BT are keen to get every child in the country growing some food over the next few years. I think the package we have now put together is a really good one and might well interest Village readers who are involved in any way with a local school, either as a parent, governor or helper. BT are offering volunteer help for any school who registers – this can be either help with building a new vegetable garden, mentoring children in growing produce, or business help. All volunteers are CRB checked, and with a workforce of 100,000 people there is plenty of opportunity to link most schools in and get some free help for them. Alongside this, we have developed an “instant” vegetable garden. These gardens are pre-grown, and once ordered (before April 8 for the summer term) they will arrive at your school as little plug plants all ready to plant out. This ensures success for the teacher and children, but also – and most importantly – allows the crops to be harvested before the summer holiday; we’d had lots of feedback from schools saying that once they had planted seeds in the spring term, the plants grew beautifully, only to crop when all the children had gone on holiday, giving them no opportunity to taste what they had grown. There are six different gardens to choose from, all priced under £50 for about 200 plants. We have early vegetables, salads and herbs for easy growing. I am hoping this will encourage schools to sign up and have a go if they are completely new to gardening and don’t know where to start. The grower for the project is a company called Mini Meadows, who also run a “Rent-a-Hen” scheme. This idea is becoming very popular, with hens hired out to schools so the children can enjoy the benefits of hens in the playground, collecting eggs and learning about hens without any hassle (Rent-a-Hen take the birds back during all school holidays). It’s a really great idea! Another exciting aspect of the schools project this year is our link up with the RHS (Royal Horticultural Society). 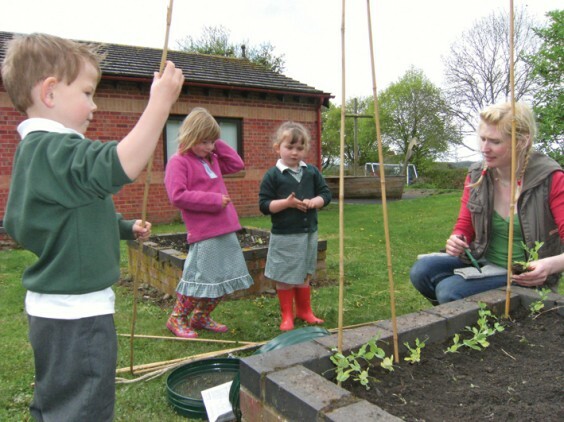 They have also been running a campaign for School Gardening and have some excellent resource materials to tie in all the benefits of gardening to the National Curriculum – these resources will be available for the schools so the teachers can make sure they are linking in the lesson plans too. You have probably gathered that I really think this is a great package, which is why I am supporting it –and from my own experience, here are a few ideas to really get children engaged in growing from as young an age as possible. Make it fun! Children have a natural sense of wonder about plants and the outdoors. Try planting some bean seeds on a damp paper towel and watching them sprout – you can tell which will be the roots and shoots quite early on. If you have room, allow each child to have their own one metre square of garden space so they get to choose what they would like to grow. This nurtures a sense of responsibility but also helps in getting them to eat some vegetables too! They are much keener when they’ve grown it themselves. Grow some edible flowers in the garden alongside the vegetables and fruit; they are usually fabulous colours and really appeal to children. Make watering equipment or watering cans fun by painting them in funky colours. Children love watering plants even if they are over-enthusiastic and drown everything! Creating some fun designs can turn a chore into a game. Make sure you get to eat what you grow! One of the most exciting things is to go out into the garden, pick some food and cook it – I still find this is the case, and children are thrilled to be part of this experience too. Grow some fruit. Alpine strawberries, which are small and very sweet, are loved by children, and you could also try yellow raspberries! We are also planning to be at Gardeners’ World Live from June 15–19 with our vegetables and hens!